If you want to have a beautiful display of fishes in your home but never owned a fish tank, the first thing that you have to do is find the best fish tanks for beginners. It’s more than getting a tank and filling it with water, there’s much more to it! 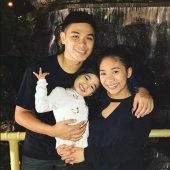 First I’ll talk about the what fish tanks are best for beginners then I will explain additional advice if it’s your first time setting up a fish tank. The Tetra Cube 29095 Cube received an Editor Rating of 8 out of 10. Its Tetra 3i filter is designed to keep the aquarium tank clean so that the fishes will have the ideal environment to live in. The LED light makes your fishes look presentable and attractive to look at. It is ideal if you want to make a beautiful view for the relaxation of your family and friends. Fishes like the guppies, platies, and other tropical aquarium fishes are the most attractive to look at in this aquarium. According to other users, the betta is best type of fish that is perfect for this aquarium. The most common complaint about this aquarium kit is the filter. 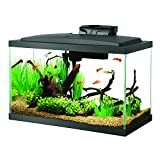 For some users the filter that comes along with the aquarium is not efficient enough for cleaning the aquarium. Other than that, it’s a great choice if you plan on having a betta or a few fishes. The Tetra 3i filter cleans the tank. The Marineland ML90609 Portrait Aquarium is one of the best fish tanks for beginners. It received an Editor Rating of 8.8 out of 10. The rounded corners of the aquarium add to the visual appeal of the fishes swimming in it. The aquarium is compact and only consumes only a few spaces in a room. It also has a lightweight construction that is why the filter and the tank are accessible. The negative side about this aquarium is the piece of plastic located at the back of the light. For some users, this piece of plastic doesn’t fit perfectly into its place. 3-Stage hidden back panel filtration with a filter pump that is adjustable. There are two available colors of LED light, which is white and blue. The white LED light creates an illusion of sunlight under water, while the blue LED light creates a moonlight effect underwater. Both are accessible and easy to toggle. The API Panaview Aquarium Kit is the best starter aquarium that received an Editor Rating of 7 out of 10. The flat back and the rounded front of this aquarium make it one of the best fish tanks for beginners. Its unique shape makes the fishes look bigger than their real size. The filter and cartridge are powerful enough to rigorously purify the water in the tank and to eliminate the aquarium pollutants that can be toxic or hazardous to the health of the fishes. However, some users say that the LED lights don’t last for a long time. The LED lights are available in seven colors: white, blues, green, red, aqua, purple, amber, and aqua. 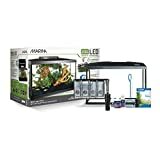 The Marina LED is the best starter fish tank that received an Editor Rating of 8.6 out of 10. You just have to follow the manual to make your Marina LED aquarium kit last for a long time. The LED lights complement the fishes swimming in the aquarium. The filtration system is easy to clean and is powerful enough to purify the water that makes the fishes healthy. There’s almost no negative issue about this aquarium kit. Some of the minor issues experienced by the users are only from a specific aquarium kit, and not on all the Marina LED aquarium kits. 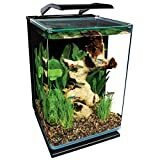 The Fluval Chi II aquarium kit received an Editor Rating of 6.8 out of 10. It is an ideal fish tank for beginners. The tank is spacious and can accommodate almost different kinds of fishes. This aquarium’s aesthetic can really provide a positive energy to those who see it. However, the tank is not relaxing to male bettas. The four tanks of the wall are too reflective, making the male bettas fight for its reflection. There are also some complaints about the filter. According to some users, the filter is not powerful enough to purify the water, especially if there are a lot of fishes in it. The Aqueon Starter aquarium kit received an Editor Rating of 7.6 out of 10. This aquarium kit is easy to assemble, making it one of the best fish tanks for beginners. The tank is nice and pleasing to the eyes. The LED lights are bright and easy to operate with a switch. 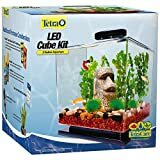 The only problem about this aquarium kit is the other products that come along with the tank. Some users say that the LED lighting lasts only for up to a few months, and the thermometer and the heater are not durable. This fish is sociable and they like to be in a group. It lives peacefully with the other fishes, making it the best starter aquarium fish that you can have. This fish loves to live in a group, especially with its own kind. The white cloud can swim in water that has a 60 degrees Fahrenheit temperature. 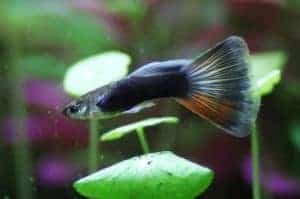 Guppies are among the easiest to take care and the most beautiful fishes to have in the aquarium. They are colorful, and they can go for a week without food. They are the best fishes to have in the best fish tanks for beginners. Betta is a beautiful addition to the aquarium. Just make sure that there’s only one of it in your aquarium because it fights its own kind. However, its vibrant color makes it the best aquarium starter fish to have. Having the best fish tank, filter, supplies, etc. does not guarantee the wellness of your fishes. The aquarium nitrogen cycle is the most important thing that you should know. The aim of the nitrogen cycle is to establish beneficial bacteria before putting your new fishes in the tank. The fishes secrete wastes. These wastes contain ammonia, which is harmful to the fish even in small amount. The bacteria convert the ammonia to nitrite, which can still harmful. The nitrobacteria will develop and it will convert the nitrite to nitrate, which is less toxic to fishes but still harmful in large amount. Even if you have the best filter on the market, you need an aquarium test kit to test the levels of ammonia, nitrite, and nitrate in the water of your aquarium. You should perform the test every month or so. Vacuum the gravel, to eliminate the uneaten foods and wastes that releases ammonia. Use a water conditioner when changing water to level out the tap water that contains chlorine and chloramine. Change the water to control the level of nitrates in the aquarium. 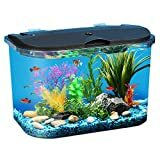 The best fish tank for beginners has a filter. You have to clean this filter for a week after cleaning the fish tank. The first thing that you have to do is unplug the filter. Squeeze the gunk out of the sponge from the filter. Clean filter and use a brush to clean the hard-to-reach areas. Put the disassembled parts altogether. In conclusion, it takes a lot of diligence to keep a pet healthy and safe, just like the fishes in the aquarium. The fish tank and the water in it need to be maintained and cleaned from time to time. It is also important that learning the best fish tanks for beginners is crucial so that your fishes will live a long life.